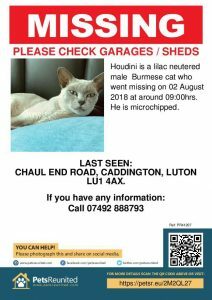 Lost or found a Burmese cat? We can help. If you would like more details or can provide information relating to any of the cats listed below please contact Mrs Carolyn Kempe, Tel: 01323 483424, Email: kempe.oakenshield@gmail.com quoting the Reference Number. Details of cats lost or found prior to February 2015 may also be obtained from Carolyn.